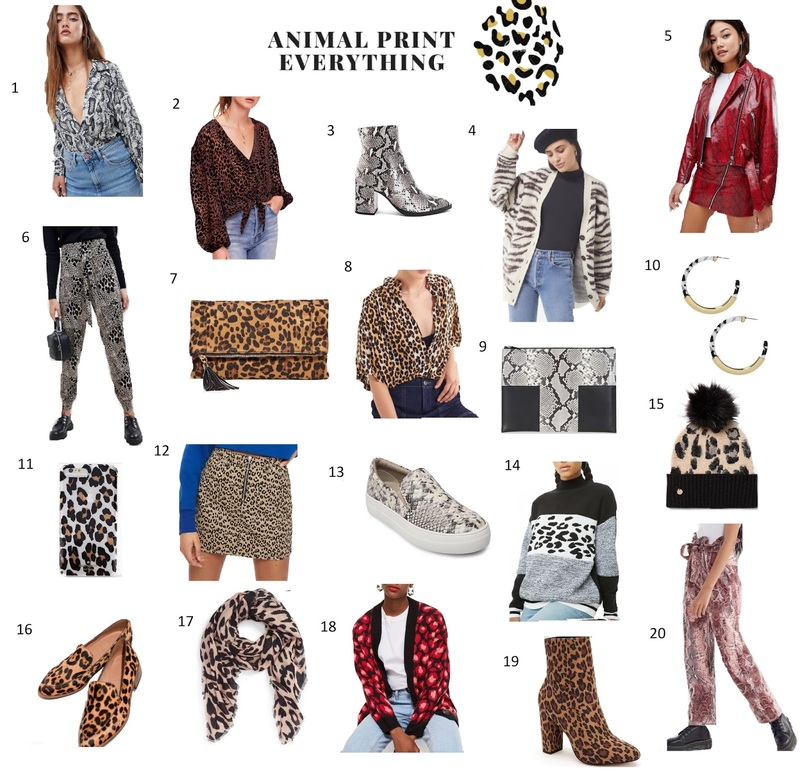 This animal print trend's got me goin' WILD (lol, get it) on shopping and adding some new pieces to my closet for the Fall season. I've always loved incorporating bold, colors, and prints in clothing so this is an easy trend for me to FALL into (omg, killin' it with the puns this intro). Check out some of my favs! 1. Snake Print Wrap Bodysuit. All fun and games until you need to go to the bathroom. JK - love a good bodysuit. 2. Bold Leopard Print Tie Blouse. Love the tie detail with the balloon sleeves. 3. Natural Snake Bootie. I don't want these. I need these. 6. Mixed Animal Print Balloon Pants. Look like a fashionista and feel like you're wearing sweatpants. Win Win. 7. Leopard Foldover Clutch. Elevate any all black outfit with this clutch. 8. High/Low Button Down Leopard Blouse. I have a blouse very similar and I love it! 9. Snake Print T-Block Clutch. A more low-key way to incorporate a bold print into your outfit. 10. Snow Leopard Print Hoops. Loving alllll hoops lately. I need! 11. Leopard Print iPhone Case. My current phone case! 13. Snake Print Platform Slip On Sneakers. I got these for my birthday and I'm OBSESSED! 14. Pattern Blocked Snow Leopard Sweater. A not-too-over-the-top animal print sweater. 15. Leopard Pom Beanie. Never met a hat I didn't like. 16. Leopard Loafers. Who says business casual has to be boring? 17. Brown Leopard Scarf. SCARF SZN, PPL! 18. Red Leopard Print Cardigan. Love the red animal print! 19. Leopard Heel Booties. Giving me all the Posh Spice vibes. 20. Red Snake Print Paperbag Trouser Pant. Bold AF and I love it. Which piece are you wild about? I say yes to all these! Especially the boots and scarves! You can never have enough shoes!! I am loving this animal print trend and it has even moved on to the men's section lately! I'm just happy that men are finally getting more fun options! So true! Love that as well! Animal print brings me back to my high school days! I was obsessed with everything leopard print. I definitely not mad that they're making a come back and kind of need a big chunky leopard print sweater. Haha I feel the saaaaame exact way! LOVED leopard in hs too! love that animal print is on trend again! There is nothing here I don't love and wouldn't wear in a nanosecond!! I'm so into this trend too, I love the red biker jacket immensely. I am so, so into this trend! Great picks, sister!